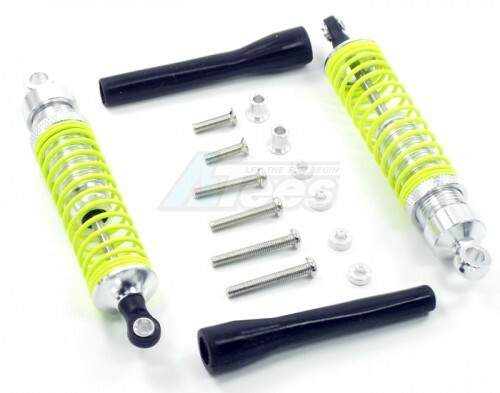 The Miscellaneous All Competition Aluminum Ball Top Threaded Shocks 100MM (2) Silver (Yellow Springs) has an average rating of stars based on 21 customer reviews. The shocks performed better than I needed, so I duplicated the setup on a couple other cars I have. Nice looking shocks. Shafts are a bit weak. I bent mine the first run! Also the springs tend to bind up a little on the shock bodies. But for the price you can't really complain too much. Replacement for factory - should have done it sooner.